When winter comes, it’s important to keep walkways safe, but the chemical compounds sold for de-icing all contain some form of salt, which you don’t want leaching into your soil. Although calcium nitrate or high-nitrogen fertilizer is often recommended as a more benign alternative, an overdose of nitrates isn’t really any better than a buildup of salt itself. In either case, soil organisms are damaged, plant roots can be burned, and leached-out excess winds up in the groundwater. So what do you do? Start with prevention. There will be very little ice to worry about if you are careful to keep the walkway well shoveled in the first place. Remove snow right down to the path surface as soon as it falls (walking on snow compacts it and makes it stick). Pile the snow on the downhill side, so it doesn’t flow over the walkway when it melts. Next, cover any ice you do get with something that will provide traction. Clay cat litter and coarse sand both work well and won’t be much of an indoor problem if you keep a mat or bootbrush by your door. Alternatively, you can add traction to the walkway by covering it with temporary “paving” that has a nonslip surface. There are specially designed flexible metal grids sold for this purpose at hardware stores and through specialty catalogs. Or you can use panels of asphalt roofing shingles. They cost less and work just as well, although they are less than lovely (sprinkle sand under the shingles so they don’t slip around). 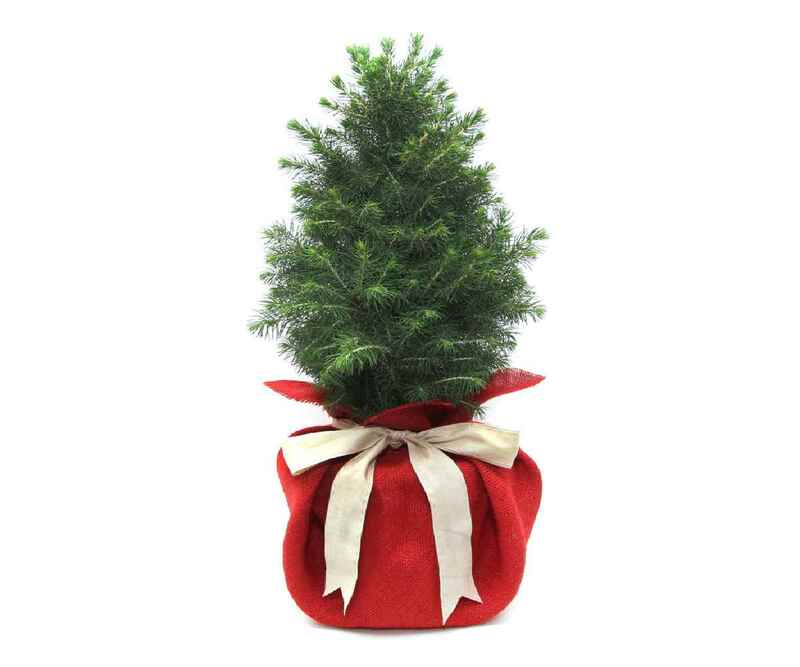 Each year many people choose to bring a living tree into the home for Christmas. 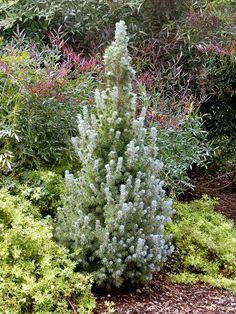 Smaller potted and even some balled and burlapped evergreens make great candidates for a living Christmas tree. Living Christmas trees should only stay in the home for 2-3 weeks and prefer cool room temperatures. They should be “eased in” to the home by holding them in an enclosed porch or garage until ready to be set up in the house and then “eased out” in the same manner when finished. Lighting the tree with cool LED lights is also a big help. Treating the tree with an anti-desiccant spray such as Wilt-Stop will also slow down moisture loss. Water the tree every day as it can never be allowed to dry out. Once the decorations are removed, plan on planting the tree immediately. This means that you need to plan ahead and prepare a planting hole now to receive the tree in January. Choose a proper location in your yard to be the final home for your Christmas tree. Take into consideration the ultimate size of the tree as well as its soil and light requirements. Dig the hold before the ground freezes. The size of the hold should be as deep as the root ball and 2-3 times as wide. Amend the soil with leaf compost and store the soil in a location where it will not freeze and be easy to access in January. Now fill the hole with straw to slow down the frost. At planting time remove the straw from the hole and install the tree using the saved soil. Water the plant heavily and mulch around the tree using the same straw that once filled the hole. Plan on watering the tree again in early spring once the soil has thawed. What a great holiday tradition to begin this year and to remember for many years to come as the trees grow and flourish! Terry is a Design Build Manager/Horticulturist/Registered Landscape Architect for the Vande Hey Company in Little Chute, Wisconsin. When growing season is done and the garden has been put to bed, it’s time to start planning for next year! I love tea and drink it the way many other people drink coffee. I have an area in my flower garden devoted to herbs, and I’m thinking about adding something new: tea. 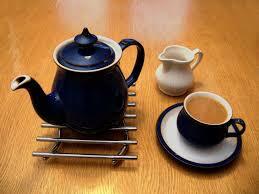 True tea (white, black and green) comes from one plant species: Camellia sinensis, hardy in Zones 6 to 9. This plant isn’t finicky (slightly acidic soil, a sunny location and plenty of water will keep it happy), but it grows slowly from seed. It can take three years to get a harvest and cuttings are challenging, so purchasing a plant seems like the right approach. Like me, you may already have herbs in your garden, such as mint and lemongrass, that you can use for tisanes, or herbal teas. When using herbs for tea, it’s important to research which part of the plant is used for making tea, such as the leaves of the mint plant, the buds and flowers of chamomile or the outer stalks of lemongrass. Freshly picked herbs can be brewed right away. You can also dry herbs to keep the cupboard stocked. 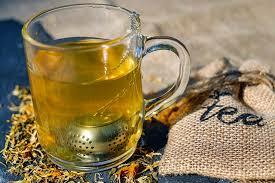 Gently tear or crush herbal leaves, buds or roots to release essential oils and boost flavor, and you might consider a tea infuser or ball instead of a strainer for a simpler brewing process to avoid having a cup full of leaves. I started this plant from a leaf cutting 8+ years ago. It loves the indoor south exposure where it has been since I got it. I really don’t pay much attention to it. It is a vining plant and needs support. When I gets to be 10 or 12 feet long, I hack it back. It is a plant the makes a very bold statement via its foliage. 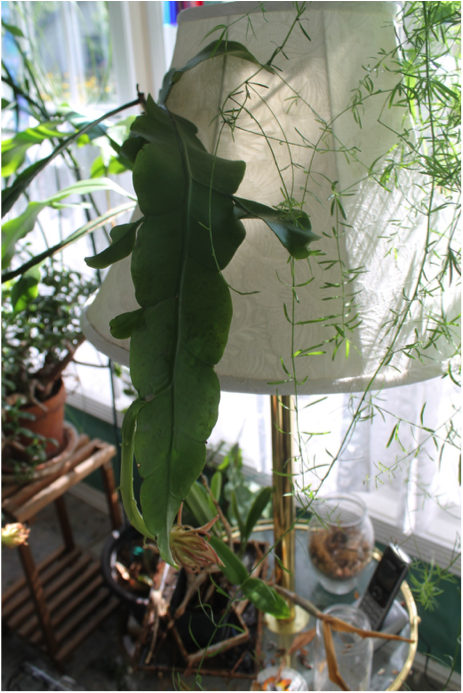 This leaf is 22 inches long.I had pretty much given up on seeing it bloom until a couple days ago – then I noticed the flower buds. These were quite a surprise and I was hoping that they would be open the following day. That night I thought I would take another peak at them. WOW! Even the internal structure is extraordinary. 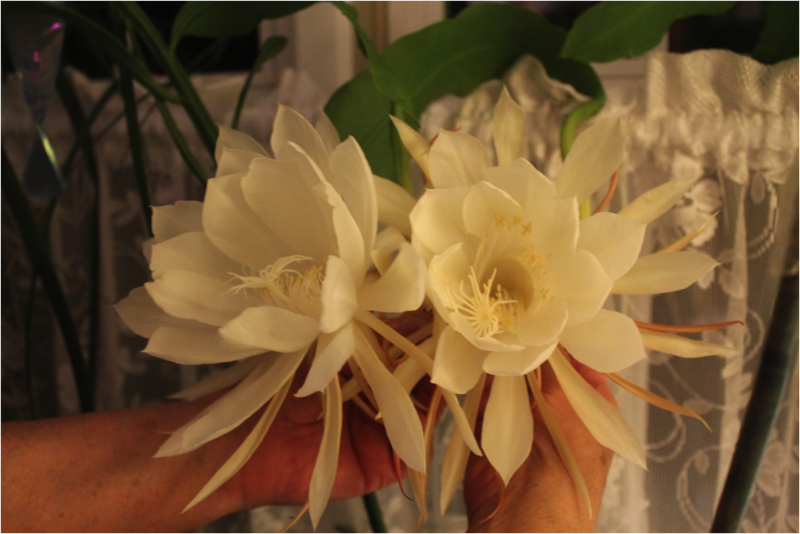 After seeing the flower, I was able to determine that the variety is most likely “Queen of the Night”. That certainly is an appropriate name. The flowers last only one night. Looking more closely at the plant, I found four other spent blossoms that I had missed. 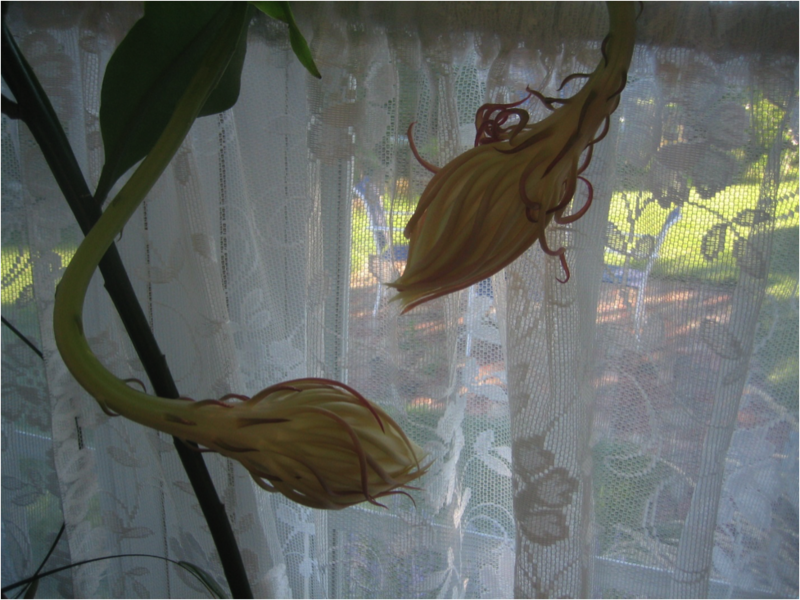 There are two more buds developing. This plant is well worth having in your collection just for the foliage. The flowers put it over the top. It is very easy to grow. Other members of this family bloom during the day with individual flowers lasting a week or so. Colors tend to be in the red/pink end of the spectrum and the plants can be quite a bit smaller, lending themselves to hanging baskets. Come visit our website at ocmga.net. Enter your email address to follow Garden Snips and receive notifications of new posts by email. For information about becoming a Master Gardener or attending one of our educational classes, visit our website at ocmga.net.